To Cite: Wei X, Fan C, Zhou Y, Kang W, Wang J, et al. The Efficacy of Add-on Telbivudine Versus Switching to Pegylated Interferon Alfa-2a in Chronic Hepatitis B Patients With Poor Responses to Adefovir, Hepat Mon. 2016 ; 16(1):e31278. doi: 10.5812/hepatmon.31278. Background: There are limited options for chronic hepatitis B (CHB) patients who have poor responses to adefovir (ADV). Objectives: The aim of this study is to evaluate the effects of adding on telbivudine (LdT) or switching to pegylated interferon alfa-2a (PEG-IFN-α2a) as alternative rescue therapies for patients with poor responses to the initial ADV treatments. Patients and Methods: Ninety-seven CHB patients with HBV DNA > 2 log10 copies/mL 48 weeks after ADV monotherapy were included in this study. Fifty-nine of these patients were treated with a combination of LdT plus ADV (LdT + ADV) daily, while thirty-eight patients were switched to PEG-IFN-α2a subcutaneous injections weekly for 48 weeks. Results: Both rescue strategies were proven to be safe and the majority of patients tolerated the therapies well. LdT + ADV led to more rapid reductions in viral loads than PEG-IFN-α2a monotherapy, with 2.14 (LdT + ADV) and 0.98 (PEG-IFN-α2a) log10 copies/mL decreases 48 weeks after rescue treatments, respectively (P < 0.00001). The rates corresponding to virological and biochemical responses were also elevated in patients who received the LdT + ADV combination therapy at the end of the observation period (88.1 vs. 68.4% for virological response, P = 0.017; 83.3 vs. 47.2%, P = 0.00045). However, the decline in the hepatitis B surface antigen (HBsAg) was more pronounced in PEG-IFN-α2a treated patients. Moreover, the cumulative rates of serological responses were higher in patients who switched to the PEG-IFN-α2a therapy. Conclusions: Both add-on LdT and switching to PEG-IFN-α2a were satisfactory and optimal treatments for CHB patients with poor responses to ADV. Both rescue strategies resulted in significant reductions in serum viral load and ALT levels, and were associated with high rate of serological outcomes in our hospital. Chronic hepatitis B (CHB) is a significant medical problem worldwide, particularly in China, where roughly 7% - 8% of the population is persistently infected with the hepatitis B virus (HBV) (1, 2). Chronic HBV infection is a vital risk factor for the development of conditions such as liver cirrhosis, severe hepatitis, and hepatocellular carcinoma, and approximately one million people die annually from HBV-related end-stage liver diseases (3). Serum HBV DNA levels have been demonstrated to be significantly and independently associated with the incidence of advanced liver diseases and liver-related mortality (4-6). Thus, the main therapeutic goal for CHB is effective suppression of HBV replication, which is intended to reduce the pathogenicity of the virus and decrease the hepatic necroinflammation (7). The current antiviral therapies for CHB include nucleoside/nucleotide analogs (NAs) and interferon-alfa (IFN-α). A previous study revealed that 180μg of pegylated interferon alfa-2a (PEG-IFN-α2a) monotherapy could result in a reduction of HBV DNA and the normalization of alanine aminotransferase (ALT) in approximately 30% - 40% of HBeAg positive patients (8). Most importantly, the serological response was elevated as a reaction to the PEG- IFN-α2a therapy with more than 30% of HBeAg seroconversion and 3% of HBsAg seroconversion having occurred 6 months post-treatment (8, 9). However, because of some severe side effects and the relatively weak inhibition of viral replication, most CHB patients still received long-term NA therapy, which has been proven to be safe and effective for HBV DNA suppression. Five NAs, including lamivudine (LAM), adefovir (ADV), entecavir (ETV), telbivudine (LdT), and tenofovir (TDF), have been licensed globally (10, 11). However, although ETV and TDF are the preferred NAs, the decision as to which drugs are to be administered should be based on various factors, such as hepatic function, resistance profile, side effects, and drug costs (7). In China, cost-effectiveness of therapy is one of the most important factors determining the choice of treatment for patients with HBV infection. Thus, patients without liver decompensation still consider ADV as the initial therapy. ADV can be a moderately effective agent; a five-year study on Chinese patients with HBeAg-positive CHB showed that ADV treatment achieved virological responses with undetectable HBV DNA in 58% of patients, biochemical responses with normalization of ALT in 79% of patients, and HBeAg seroconversion in 11% of patients. However, genotypic resistance was identified in 14.6% of patients (12). Moreover, ADV treatment was also associated with higher rates of primary nonresponse and particle response due to the suboptimal dosages and moderate anti-viral potency (13). A rescue strategy is required for patients who suffer from particle response to anti-viral agents; however, there has been no consensus on the most effective therapy for CHB patients with poor responses to ADV monotherapy. It is recommended that for patients who develop drug resistance to ADV, add-on NAs without cross resistance or switching to IFN-based therapies are suitable options (7). 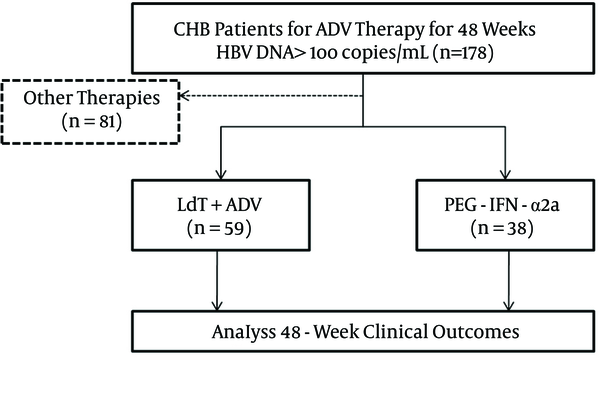 Therefore, we evaluate CHB patients with persistently detectable HBV DNA after 48 weeks of ADV monotherapy, who either added on LdT or switched to PEG- IFN-α2a for rescue treatment, in search of reasonable optimization strategies. Patients with chronic hepatitis B who receiving ADV therapy were screened from July of 2009 to March of 2012 at the department of infectious diseases in Tangdu hospital. The patients enrolled in the study met all of the following criteria: 1) positive for HBsAg for at least 6 months with HBV DNA >4 log10 copies/mL before initiation of ADV treatment; 2) had not received any anti-HBV agents before initiation of ADV treatment; 3) remaining positive HBV DNA was present after 48 weeks of ADV (10mg orally once daily) therapy; 4) not co-infected with HCV, HDV or HIV; and 5) not concurrently afflicted by immunocompromised diseases, autoimmune diseases, decompensated liver cirrhosis, severe hepatitis, or hepatocellular carcinoma. The study protocol was approved by the ethics committee of Tangdu hospital (Code: TDLL-2009033, approval date of June 5, 2009). The ethical considerations included that each participant was to be provided with detailed information on the written form of the research program, and all information was to be available in language and terms understandable by each subject. Subjects were informed that patient privacy was an integral part of the ethical approval process. The study conformed to the ethical guidelines of the 1975 Declaration of Helsinki, and written informed consent was obtained from all patients. Research was conducted in the form of a retrospective cohort study, and was performed in Xi’an, in the Shaanxi province of China. The flow chart of the study is shown in Figure 1. The enrolled patients were either administered add-on LdT (600 mg orally once daily) for combination therapy or switched to PEG-IFN-α2a (135 μg or 180 μg by subcutaneous injection weekly). All patients were monitored every 12 weeks for a total of 48 weeks. Virological and biochemical assessments were performed at routine examinations during every visit, and complete follow-up data was collected. Serum HBV DNA was quantified by a real-time polymerase chain reaction (PCR) kit (PG Co Ltd, Shenzhen, Guangdong, China) with a detection limit threshold of 2log10 copies/mL using the Applied Biosystems 7500 Real-time PCR System (Thermo Fisher Scientific, Foster City, CA, USA). HBV DNA levels were logarithmically transformed for analysis. HBsAg, HBeAg, and anti-HBe were quantified by the Architect HBsAg, HBeAg, and anti-HBe Reagent kit (Abbott GmbH and Co. KG, Wiesbaden, Germany) using the Abbott Architect I2000 Immunology Analyzer (Abbott Diagnostics, Abbott Park, IL, USA). HBsAg > 0.05 IU/mL, anti-HBs > 10 mIU/mL, HBeAg > 1.00 s/co, anti-HBe < 1.00 s/co, and anti-HBc > 1.00 s/co were defined as positive values. Genotypic resistance was assessed by direct sequencing in all enrolled patients. Serum biochemical assessments (including ALT, creatine kinase, bilirubin, albumin, blood urea nitrogen, and creatine) were measured using an automatic analyzer (Hitachi 7170A, Hitachi Ltd, Tokyo, Japan). The ULN of ALT was defined as 40 IU/L for men and 37 IU/L for women. ALT levels are expressed as values representing a ratio to the ULN due to the difference in the reference point between males and females. All of the equipment was calibrated every six months. Quantitative data was presented as median values (IQR), and categorical variables were expressed as counts and percentages. All data were analyzed using SPSS version 15.0 for Windows software (SPSS Inc., Chicago, IL, USA). The Friedman test was used for the assessment of quantitative data. Chi-square or Fisher’s exact tests were used for the categorical data. A P value of less than 0.05 was considered significant. A total of 387 CHB patients received ADV of 10 mg daily as an initial antiviral strategy. One hundred and seventy-eight of 387 patients maintained HBV DNA levels > 2log10 copies/mL. Twenty-three patients demonstrated genotypic resistance (rtA181V/T and/or rtN236T) to ADV. Eighty-one patients received other therapies, and the other 97 patients were enrolled in the study for rescue therapies. Fifty-nine patients were treated with a combination of LdT (600 mg/day) and ADV (10 mg/day), while the other 38 patients were switched to PEG-IFN-α2a (135 μg or 180 μg of subcutaneous injections weekly). The baseline characteristics of the enrolled patients are shown in Table 1. The four patients who received LdT + ADV combination therapy were diagnosed with compensated cirrhosis and an F3 stage of fibrosis based on the Fibroscan results. The demographic and laboratory characteristics were similar between the two groups (P > 0.05). aValues are expressed as median (IQR). HBV DNA was reduced rapidly after 12 weeks of add-on LdT with a median decrease of 1.92 (IQR: 0.26 - 2.39) log10 copies/mL compared with the baseline (P < 0.01, Figure 2A). The median decrease of switching to PEG-IFN-α2a was 0.45 (IQR: -0.04 - 1.01) log10 copies/mL. The reduction failed to achieve significance (P = 0.072, Figure 2A). The levels of HBV DNA decreased continuously, and the mean decrease was 2.08 (IQR: -0.12 - 3.87) log10 copies/mL in patients who received LdT + ADV combination therapy, and 0.92 (IQR: -0.18 - 1.67) log10 copies/mL in patients who switched to PEG-IFN-α2a (Figure 2A). Furthermore, a greater proportion of patients administered with add-on LdT showed VR compared with patients who switched to PEG-IFN-α2a at 12 weeks [64.4% (38/59) vs. 26.3% (10/38), P = 0.00025], 24 weeks [78.0% (46/59) vs. 31.5% (12/38), P < 0.00001], and 36 weeks [88.1% (52/59) vs. 44.7% (17/38), P < 0.00001]. Two patients achieved a virological breakthrough at 48 weeks after LdT + ADV combination therapy. Direct sequencing showed rtM204I mutation, which demonstrated genotypic resistance to LdT. Although the VR rate of patients who switched to PEG-IFN-α2a reached 68.4% (26/38) at 48 weeks, this number is still lower than the rate of patients with add-on LdT [88.1% (52/59), P = 0.017, Figure 2B ]. A, The mean reduction of HBV DNA from the baseline. The mean HBV DNA levels (log10 copies/mL) were plotted over time, and error bars indicate standard deviation. “*” and “#” symbols indicate P < 0.05, “**” symbol indicates P < 0.01 compared with the baseline. (B) The rate of virological response (undetectable HBV DNA) during the observation period. A total of 84 patients (48 in the add-on LdT group and 36 in the group that switched to PEG-IFN-α2a) had abnormal ALT levels at the baseline. The ALT levels gradually decreased after LdT + ADV therapy, and ALT was significantly downregulated after 48 weeks of combination therapy (P < 0.05, Figure 3A). However, there was a fluctuation in ALT levels with PEG-IFN-α2a treatment during the first 24 weeks, and two patients who had normal ALT levels at the baseline revealed elevated ALT levels during PEG-IFN-α2a therapy. The ALT levels decreased after 36 weeks, and the difference in the mean reduction in ALT levels from the baseline over 48 weeks of therapy was not remarkably different between the two groups (0.91 × ULN vs. 1.08 × ULN, P = 0.821). Furthermore, the proportion of patients achieving BR was notably higher in the add-on LdT group at each point of time that was monitored (P < 0.0001, Figure 3B). A, The ALT levels (× upper limit of normal [ULN]) during the observation period. The mean ALTs were plotted over time, and error bars indicate the standard deviation. “*” and “#” symbols indicate P < 0.05 compared with the baseline. B, The rate of biochemical response (ALT normalization) during the observation period. A total of 92 patients (54 in the add-on LdT group and 38 in the group that switched to PEG-IFN-α2a) were positive for HBeAg. Interestingly, a greater proportion of patients who switched to PEG-IFN-α2a showed HBeAg loss compared with patients who added on LdT [14/38 (36.8%) vs. 10/54 (18.5%), P = 0.049, Figure 4A ]. Moreover, there was also a notable difference in the proportion of HBeAg/anti-HBe seroconversion between the two groups [9/38 (23.7%) vs. 4/54 (7.40%), P = 0.027, Figure 4A ]. HBsAg loss was observed in one patient who received PEG-IFN-α2a therapy. The HBsAg decline was more pronounced in patients who received PEG-IFN-α2a than in those who were treated with LdT + ADV (Figure 4B). A, The rate of serologic response (HBeAg loss and HBeAg/anti-HBe seroconversion) during telbivudine plus adefovir combination therapy. B, The mean reduction of HBsAg from the baseline. The mean HBsAg levels (log10 IU/mL) were plotted over time. “*” symbol indicates P < 0.05, “**” symbol indicates P < 0.01 compared with the baseline. Generally, both rescue strategies were determined to be safe, and the majority of patients tolerated the therapy. No severe adverse events were observed. Of the patients who received add-on LdT therapy, 17 showed an increase in their creatine kinase levels, but these returned back to normal after a temporary withdrawal from LdT without receiving any additional treatments. In patients who switched to PEG-IFN-α2a, fever after the first subcutaneous injection occurred in all patients. The counts corresponding to white blood cells, neutrophile granulocyte, and platelets decreased in majority of patients. Four patients (10.5%) who had neutrophile granulocyte counts of less than 0.75 × 109/L received granulocyte colony-stimulating factor therapy. There was no discontinuation due to these adverse events. Furthermore, no decompensated cirrhosis or hepatocellular carcinoma was reported during the observation period. To the best of our knowledge, this is the first study to compare the efficacy of add-on LdT versus switching to PEG-IFN-α2a as rescue therapies for patients with poor responses to ADV. In the current study, add-on LdT demonstrated a more rapid and sustained suppression of HBV DNA replication than switching to PEG-IFN-α2a. Approximately 90% of patients achieved undetectable HBV DNA levels in response to LdT + ADV combination therapy. Moreover, ALT normalization was observed in nearly 60% of enrolled patients, and the majority of them were receiving add-on LdT treatment. This may be partly because of IFN-mediated immune clearance responses in patients undergoing PEG-IFN-α2a therapy. In contrast, significantly higher rates corresponding to HBeAg loss and HBeAg/anti-HBe seroconversion were observed in patients who switched to PEG-IFN-α2a therapy. Although ADV has been considered to be a valuable second-line antiviral agent for patients with CHB in some newly updated guidelines (2, 7), cost is still the most important influential factor for determining the choice of treatment in developing countries due to pharmacoeconomic reasons (14). Thus, ADV is still widely used as an initial therapy for CHB patients in many regions of China. Zhou et al. (15) demonstrated that genotypic resistance was not found in most of the primary non-responders to ADV compared to patients with virological rebound during ADV therapy, which shows that it is vital to determine inadequate responses to ADV early on in order to initiate the appropriate rescue therapy. Furthermore, establishing a kind of road map for affordable choices of antiviral drugs is also important, and the long-term outcomes of CHB could be improved under well-managed treatment (16). An increasing number of studies have tried to evaluate the different rescue strategies for patients with persistent detectable HBV DNA during ADV therapy. As the first-line NAs for CHB patients, ETV and TDF have also been considered as rescue therapies for patients with poor responses to ADV. Reijnders et al. (17) revealed that switching to ETV at 1 mg daily led to a slow reduction of HBV DNA in patients with persistently high viral loads during ADV therapy. However, add-on ETV was shown to have better efficacy than switching to ETV monotherapy for ADV refractory patients with prior LAM resistance, although the rates corresponding to undetectable HBV DNA levels were relatively low in both groups (44.7 vs. 34.5% at 96 weeks after therapy) (18). Furthermore, Wang et al. (19) also suggested that combination therapy with ETV plus ADV was effective and well-tolerated in CHB patients in which NA treatments had failed as a 2-year rescue therapy; the results were determined based on a retrospective study conducted in a single center. In contrast, TDF monotherapy showed strong and long-term viral inhibition in patients with suboptimal or incomplete responses to ADV, which had a comparable impact to TDF plus emtricitabine treatment, with more than 70% of patients achieving virological responses (20, 21). However, a more recent study revealed that switching to TDF resulted in slower HBV DNA decline in ADV-experienced patients compared with treatment-naïve patients (22). Thus, it is widely accepted that combination therapies may offer a potential means of managing suboptimal responses or drug resistance to monotherapy (23). In addition, more cost-effective strategies for suboptimal responses to NAs were discovered due to economic reasons. LAM plus ADV (LAM + ADV) therapy presented similar VR rates to ETV in patients with ADV-resistant mutations (24). Chen et al. (25) evaluated the different combination treatments with either LAM + ADV or LdT + ADV in patients with poor responses to ADV. Both combination treatments resulted in remarkable viral suppression and ALT normalization, and the rates of VR and BR were similar in both groups. However, LdT + ADV therapy demonstrated higher rates of HBeAg loss (38.46% vs. 7.14%) and HBeAg/anti-HBe seroconversion (26.92% vs. 3.57%) at 12 months after treatment. These results were further confirmed by comparing the LdT + ADV treatment with ETV monotherapy, which revealed that the combination of LdT and ADV showed a notably higher rate of e antigen seroconversion (20% vs. 0%) (26). The current study also revealed that LdT + ADV achieved undetectable HBV DNA and ALT normalization in more than 80% of patients with poor responses to ADV. Although serological outcomes were not as good as those when switching to PEG-IFN-α2a, the rates of HBeAg and e antigen seroconversion were comparable with the rates in other studies (25-27). At present, few studies have focused on IFN-α-based rescue therapy strategies in CHB patients with poor responses to NAs. Chan et al. (28) reported the efficacy of PEG-IFN-α2a in CHB patients with a relapse of hepatitis after cessation of NA treatment. 40 patients who received NA therapy for more than 12 months and stopped for more than 6 months were treated with a 48-week administration of PEG-IFN-α2a. 35% (14/40) of patients achieved sustained VR 24 weeks post-treatment, and 5% (2/40) of patients reached HBsAg loss. Zhang et al. (29) conducted a study with 50 CHB patients without HBeAg loss after long-term LAM treatment which had at that point been withdrawn. Those patients who achieved the biochemical breakthrough received PEG-IFN-α2a for 48 weeks. The rate corresponding to both undetectable HBV DNA and HBeAg loss was 51.2%, and HBsAg loss occurred in 20.9% patients. Sun et al. (30) also assessed the efficacy of PEG-IFN-α2a and ADV in patients with LAM resistance. 155 patients were treated with PEG-IFN-α2a for 48 weeks and 80 patients received ADV therapy for 72 weeks. 9.3% (14/151) of peginterferon alfa-2a-treated patients achieved HBeAg seroconversion at the end of the 48 weeks of therapy, in contrast to 3.8% (3/80) of adefovir-treated patients after 72 weeks of continuous therapy. The present study revealed that although the VR and BR rates (68.4% and 47.2%, respectively) in patients who switched to PEG-IFN-α2a were lower than the rates among those who received LdT + ADV combination therapy, the rates were still comparable or even higher than those of other experiments in patients with poor responses to NAs. Moreover, the HBeAg seroconversion rate was elevated and HBsAg demonstrated a rapid decline in response to PEG-IFN-α2a therapy. The safety profile and incidence of PEG-IFN-α2a in treatment of CHB patients with poor responses to ADV was similar to the results in previous studies (8, 30). No patients revealed ALT flare or severe hepatobiliary disorder during the observation period. An important limitation of this study is that it is a retrospective and uncontrolled study. Ideally, the observation time should have included the post-treatment period, especially in patients administered with PEG-IFN-α2a therapy. However, most patients who received LdT and ADV combination therapy are still in the on-going treatment process. Furthermore, large-cohort, randomized clinical trials are needed to further support the available findings on optimized strategies for CHB patients with poor or suboptimal responses to NAs. In conclusion, we have provided clinical evidence that both adding on LdT and switching to PEG-IFN-α2a are satisfactory optimal treatments for CHB patients with poor responses to ADV monotherapy in our hospital. The safety and tolerability profile of the therapy was good, with low genotypic resistance to LdT. Both rescue strategies lead to significant decreases in serum viral load and ALT levels, and are associated with high rates of serological outcomes 48 weeks after therapy. Authors’ Contribution: Xin Wei, Chao Fan, Yun Zhou, Wenzhen Kang, Jiuping Wang, Li Sun, Linxu Wang, and Meijuan Peng enrolled the patients. Xin Wei, Jianqi Lian, Zhansheng Jia, and Chunqiu Hao analyzed and interpreted the data. Xin Wei, Chao Fan, and Chunqiu Hao prepared the manuscript. Chunqiu Hao supervised the study. Financial Disclosure: No benefits in any form have been received or will be received from any commercial party related directly or indirectly to the subjects of this article. Funding/Support: This study was fully funded by National Natural Science Foundation of China (81471541,81101246).